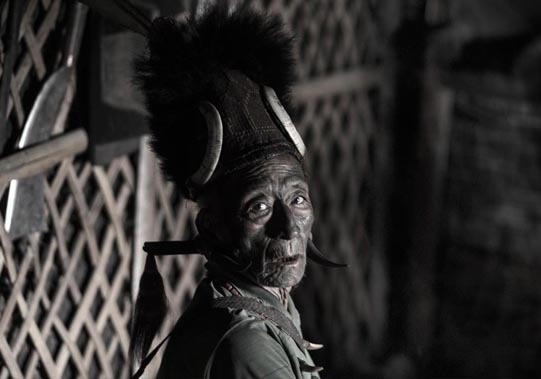 Way up in the furthest reaches of North east India, bordering Myanmar lies Nagaland, home to what were once fearsome headhunters. The most fearsome were the Konyak scattered around in small communities near the town ship of Mon. Even today, some of these men, already in their 70’s and 80‘s look extremely fiercesome and takes but a small stretch to imagine them in mortal combat with their enemies. 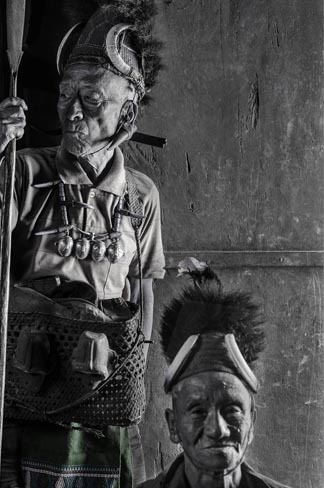 These tattooed men have not been hunting heads since the 70’s and now, sadly, their days are numbered as they fall prey to old age and the pipe. Man Yan is 83 and even at his advanced age, he exudes a ferocity that must have once terrified any enemy who was unfortunate enough to cross his path. 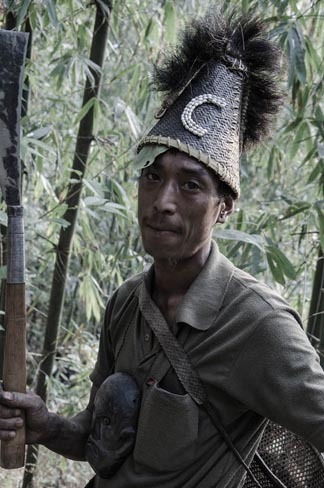 Wearing a headpiece of monkey fur, this young brave has no where to go. Education, beyond the basics is too much of a foreign concept and too far out of his life experience to embrace. Where once a tattooed face was a sign of status and high integrity, it is now little more than a curiosity, as the values in his community have been changed beyond his recognition. Akhah the Hunter is from a younger generation and he also sees little point in becoming educated and braving the outside world. It is their children who may embrace the values of a larger universe. 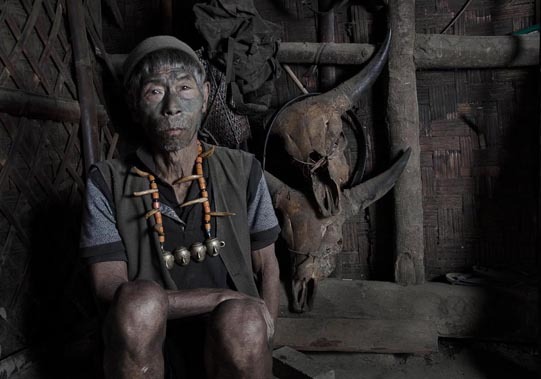 Pen Chen lives with his son a metal worker who spends his time making Naga artefacts for tourists and others in the community who may like to buy them. 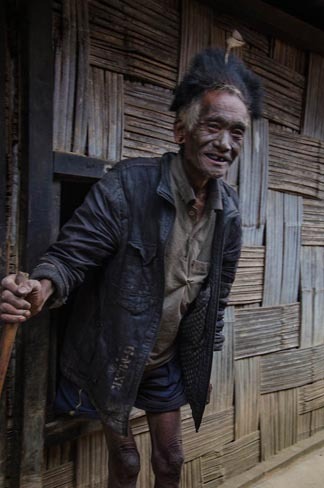 Wang Cha is 77 and has also seen his life change. 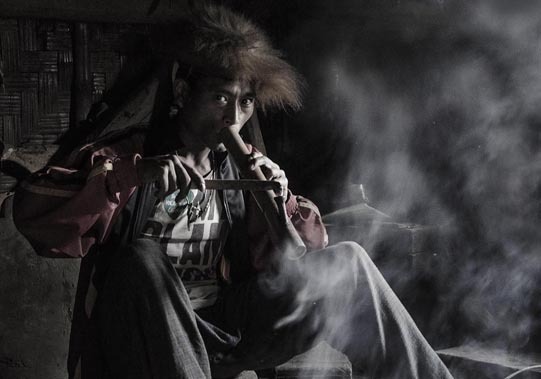 Like the other elders, he spends much of his time with the pipe and sitting discussing earlier times. 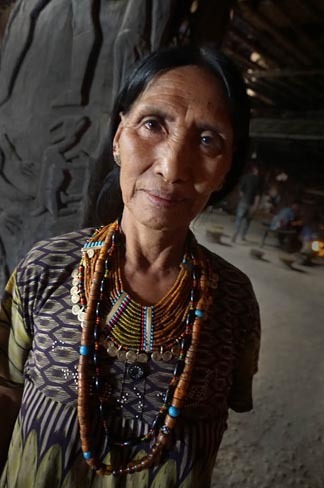 Ama Ngap Khao is the matriach – the strong glue that holds her large extended family together. While some family members have moved out to the big city of Mon, where her grandchildren attend school. she keeps the home fires burning and remains a stalwart of the community. 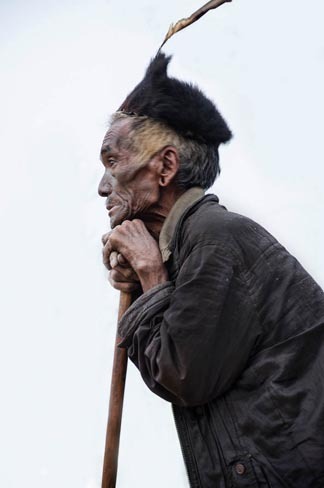 Wangnam, an old old Naga headhunter leans on his stick as he gazes over the landscape of his life, dreaming of his glorious youth. Before the missionaries and government officers came and changed their life irrevocably. Now it is just the pipe and dreams of the past.